OK, yes. Thanks for your interest. I’ll post those images here if all goes well. This first pair is separated by 12 sols and is just what I wish we had more of, pairs acquired from the same vantage at the same time of day. There are two definite changes. In the centre of the image a tiny new grain flow appears and up and to the left from centre an escarpment retreats becoming less straight. These two are separated by 22 sols. This isn’t such a good pair but the change is bigger and easy to see, top centre in the first image and far left just above centre in the second image. The top left edge of an alcove retreats and a new grain flow appears. The most direct evidence, from the rovers, strongly suggests that sand ripple movement is a rare event on Mars, probably happening only at the onset of dust storms (Gusev 2007), and even then isn’t very impressive moving only the smallest scale of ripple a few centimeters. And we don’t really know if sand saltation was involved. Sand grain reptation pushed along by reptating dust aggregates might be enough to cause the minor changes observed. 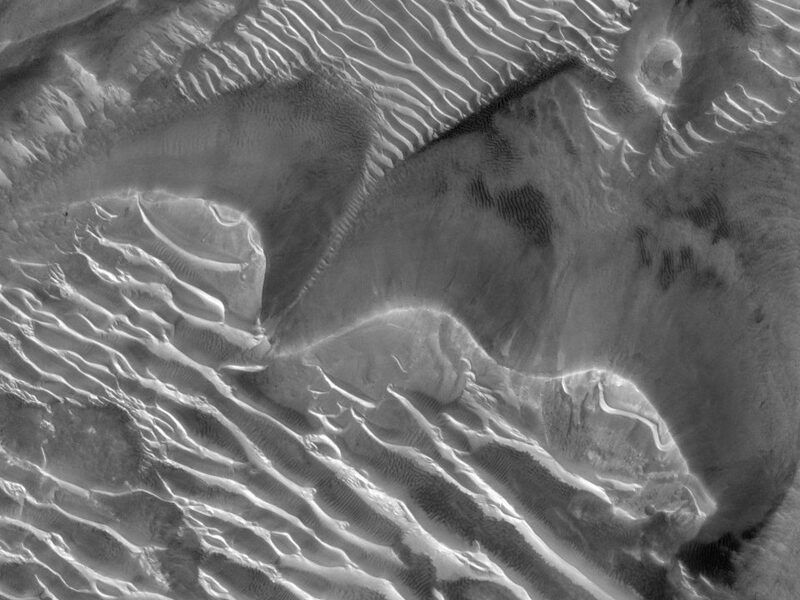 All the other evidence is less direct, generally based on the very presence of dunes and ripples, and now dune and rippune movements recorded from orbit. Has there been any sand ripple movement along the Gale traverse during the 3 year mission? This is a question that scientists seeing dune movement from orbit should be trying to answer, because the orbital and on-the-ground investigations are telling very different stories. I’ve got a Ron Greeley et al abstract in front of me from 1974, in which the authors conclude based on wind tunnel experiments that sand saltation on a flat surface would initiate in minimum winds of 400 km/hr. Could it be that it actually is happening at wind speeds as low as 40 km per hour? There’s been a long concerted effort (by Greeley too) to make this possible in theory, since everyone knows that it has to be true. I think that this is an unresolved issue that Mars science has somehow forgotten is unresolved. Oh, we haven’t forgotten it, believe me. There are papers over the years that simulate or model saltation on Mars. There are debates over what the threshold for saltation should be (with some fairly recent good wind tunnel tests done by Jon Merrison, doi:10.1016/j.icarus.2007.04.035). And I think it’s pretty clear that saltation did indeed move those ripples in the Columbia Hills. They moved in the middle of the 2007 (Mars Year 28) global dust event (don’t get me started on the political tragedies that prevent Mars landers from taking decent, if any, meteorology data…). I don’t know if anybody had a look at the rover deck after the storm (I imagine someone did although I haven’t seen any publications), but earlier in the mission there were some solar panel cleaning events on Spirit where afterwards they found accumulations of sand grains on the rover deck, at a height of ~0.8 m (see and ). So saltation of hard grains is clearly happening, although it seems to be generally limited to short episodes. I think there’s a lot about the process that we don’t understand though. Sand size particles have turned up on the MER decks and this may be evidence of sand saltation, though I can’t rule out rover activity (grinding, brushing, wheel slippage). I don’t want to make a case for there being no sand saltation at all on Mars because I don’t think this is necessary to say that there is NO WHERE NEAR ENOUGH sand saltation in evidence to Curiosity to explain how some dunes in Gale could be moving metres per year. Its not a detail. There’s a GULF of a few orders of magnitude. Don’t think I’m being critical of the research that’s seeing the dune movement. I think that it may be the most important Mars research going, because it shows up this contradiction so clearly. Contradictions are often fertile in science, accumulating toward a paradigm shift. Another really exciting area of research right now are the RSL (Recurring Slope Linae), a new category of the slope streaks that have puzzled for decades. These have quite a lot in common with the rapid movement of dark dunes. They are just as impossible in being too active to be easily explained by any Mars process we know of. What keeps the RSL coming back year after year through geologic time? Where does the energy come from to move that dark stuff up the slope so we can catch it sliding down? 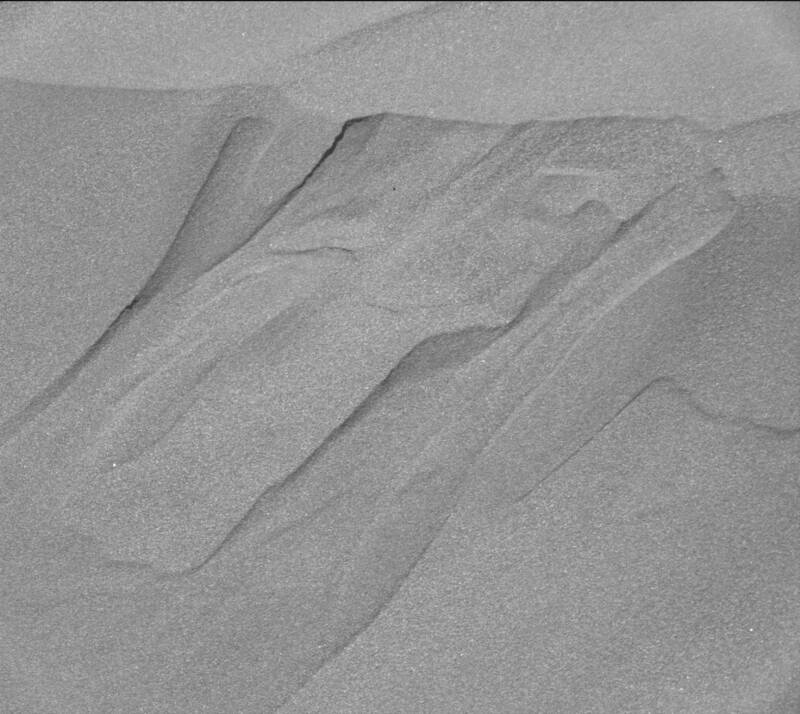 The volume of material moved by a big RSL over the active season might be similar to the volume moved in the same period by an active dark dune. What we get to see in both cases is colluvial change. The RSLs move down slopes. With the dunes its the colluvial advance of slip faces that is most obvious, but the rippunes that uniformly cover active dunes move too. Interesting that we finally get to see moving ripples (the rippunes) from space and from the ground and they turn out, against all expectation, to have a colluvial form of movement as well. Frequent dust movement on Mars is well established, but sand movement is apparently a far rarer event, based on the rover results. 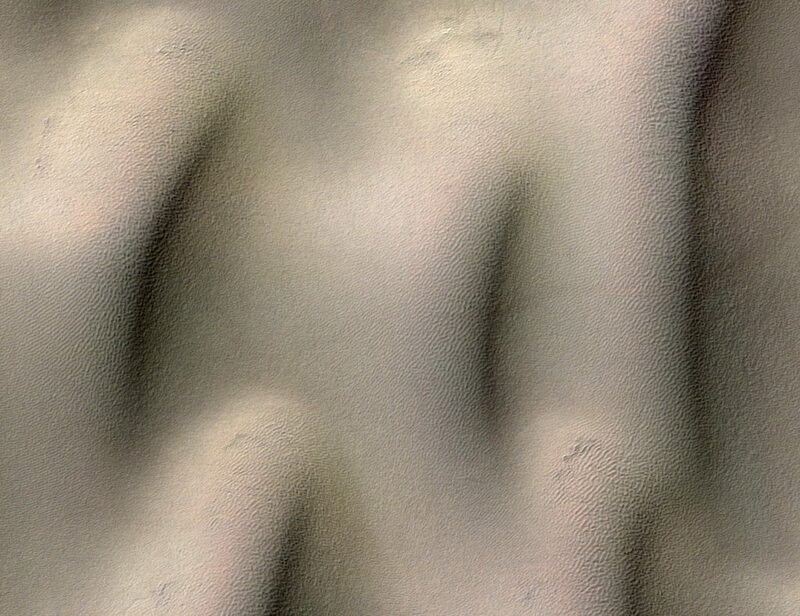 In close to 20 years of rover observations (counting all three sites separately) during five full Mars years, sand ripples have been seen to move just once. This was during the dust storm at Gusev in 2007. Some of the smallest ripples moved a few centimetres. The ground surface was left in a very dusty condition, not cleared of dust. This rarity of sand movement is in general agreement with wind tunnel and numerical simulations, which suggest that only the most extreme Mars winds could lift sand. If sand moves across long distances, based only on the ground truthed data, I think that it might take thousands of years for an average grain to transit this image of the dark crater. I don’t have an explanation for the contradictions I see. I look at the dark slopes on these crater walls and they remind me of many other dark sand slopes that the rovers have imaged, and particularly the active dark slopes, which at least have some possibility of explanation based on recent colluvial disturbance. Wish I could get you interested in that paper out of Brown U (see below). 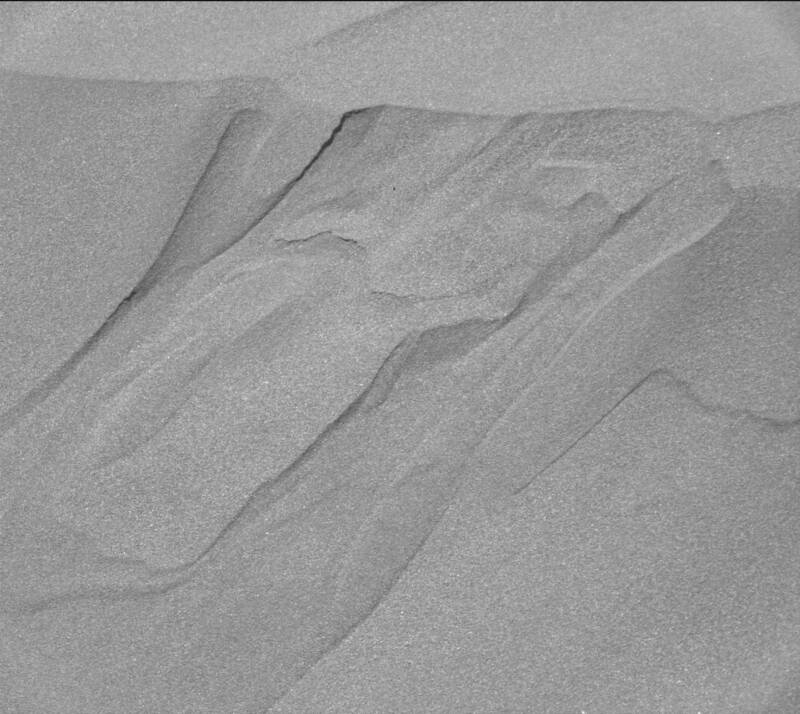 The “slipfaces” on Namib dune are not by far the first slide-active slopes we’ve seen. At Gale there are several hundred examples of non-dune sand slopes that have recently moved. There are have been no imaged changes to sand ripples since landing. Gah, I wrote half a response to this and then deleted it by mistake. Here’s a synopsis. First: love the term “rippunes”. We do need new terms for these things, I’m tired of explaining the difference to people, and then stuff like this (or TARs) pops up and all I can do is shrug. 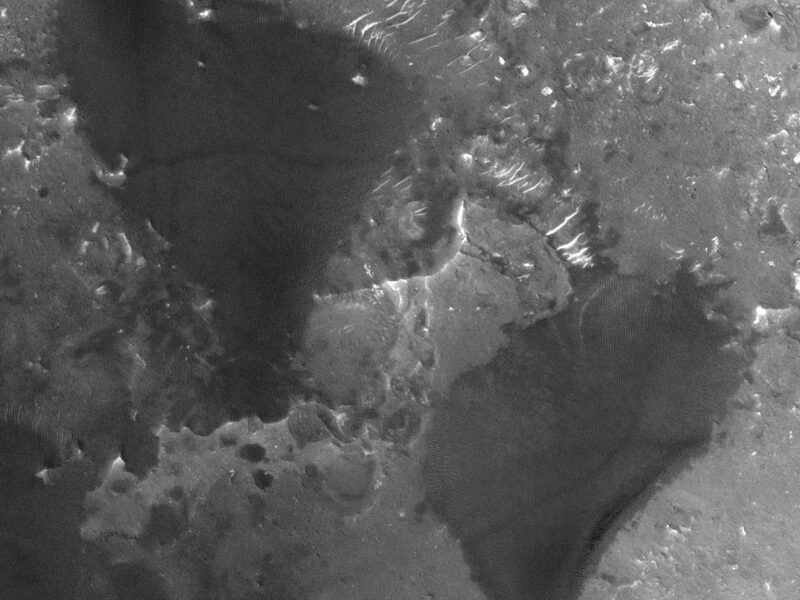 Second: HiRISE images show that over timescales of Mars years, both the dunes and the “rippunes” are moving (something like ~1 m/Earth year, it’s in Silvestro et al., 2013). It’s a shame we didn’t get to see them do so while Curiosity was nearby. So I agree that sand movement is relatively rare on Mars, but I do think it happens. Maybe episodically. And I agree that the mechanics of the saltation and reptation processes must be far different than those on Earth, at least in some ways. There’s a lot not understood about grain transport on Earth too, and I’m hoping that we can use the Mars “test case” to learn something more about aeolian transport on Earth. I don’t doubt that both the dunes and rippunes are moving, sometimes at rates in the order of 1 m per year, especially because we DID get to see movement while Curi was present at Namib. I did at least. (I spent a lot of time looking for changes, and I have to say that the image resources available for these comparisons weren’t terrific. I wish that aeolian scientists had had a greater influence on the rover’s activities in this regard.) I couldn’t find any changes to the main slipface, but I did find changes to rippune slipfaces. With permission I would be happy to post two image pairs that capture most of them. These were changes to rippunes near the rover but not part of the wheel disturbance of a rippune that caused slides, so they might well be native. 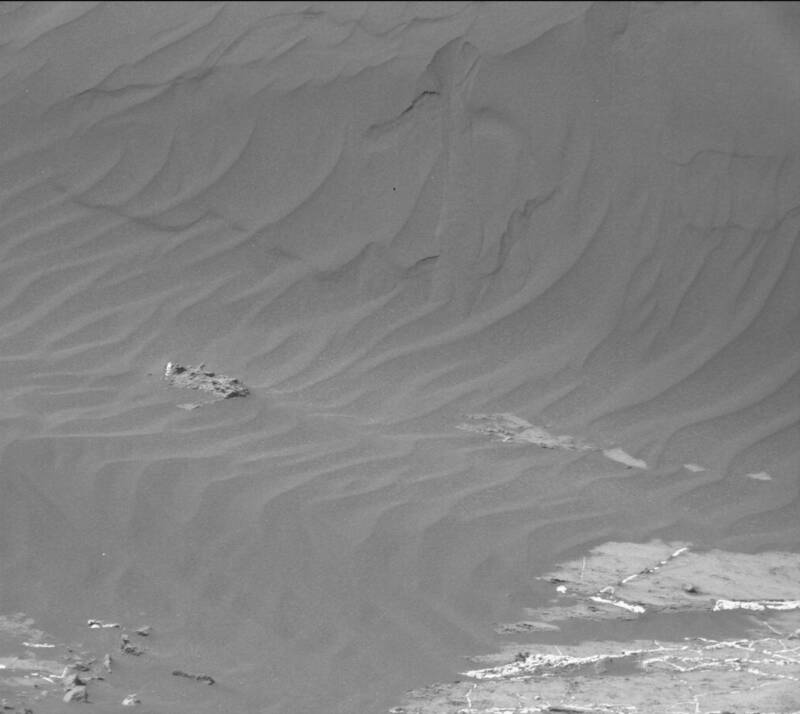 Tiny scarps retreat and tiny new grain flows appear. Its good to have these proven recent changes to compare with the recent looking, sharply detailed, slide structures on other rippunes and on the main slip face. I think there’s been recent change in many places. Overall though it looks like a series of small changes spread out in time, not like a record of big episodic change from a storm. At first sight the main slipface of Namib looks remarkably like the slipface of a Terran dune, but there’s plenty of strangeness too. The grainflow tracks differ in apparent freshness, but again it looks like there aren’t clear “generations” of these dating from particular storms, but more like a series of slightly older and older individuals. Some slide tracks appear fresh at the top and old at the bottom. And what about all those horizontal fractures in the sand? I’ve had a hard time finding out much about these. I know they sometimes occur on Terran dunes, but not much more. They are ubiquitous on Namib’s slipface, high and low and on all apparent ages of surface. There are even fractures crossing from old surfaces into the most recent grainflow track. On the rippunes fracturing and sand slab movement is a type of mass wasting as common as grainflow. I tend to see this in the context of all the other mass wasting of sand slopes that the rovers have recorded before Namib. Particularly at Gale, but also at Gusev, patches of sand crust have shifted slightly downslope in a large percentage of events. 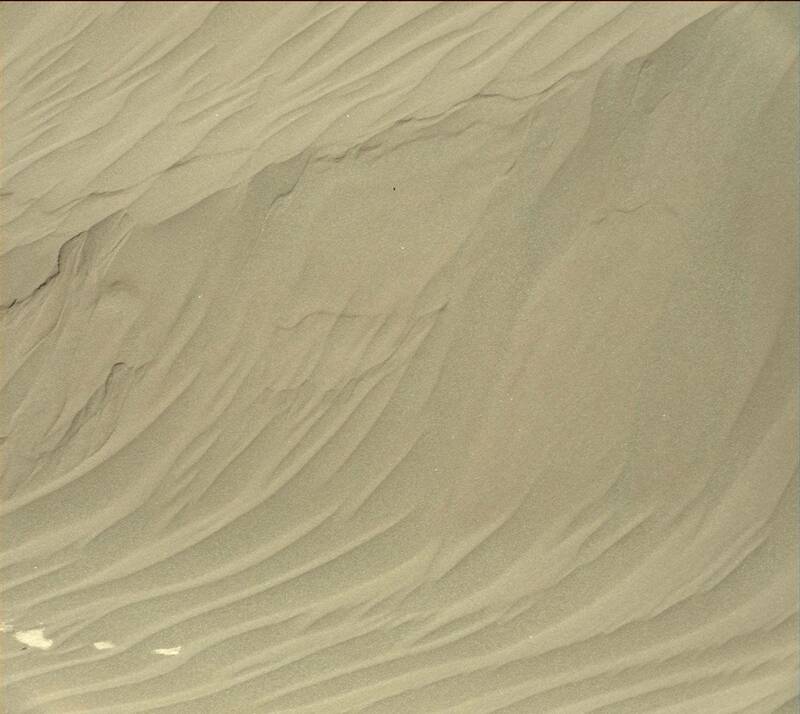 The non-dune, non-rippune mass wasting is clearly recent and ongoing and not caused by the rover, because there’s plenty of older healing slides on the same slopes. 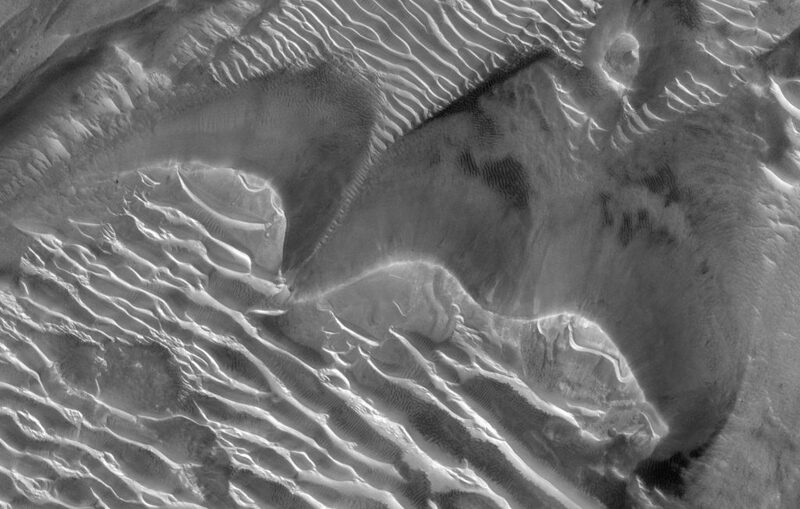 The rippune and dune activity has a lot in common with the sand slope wasting in other locations. Until we’ve explained that, I’m keeping an open mind about just how slope wasting is connected to wind transport. Yes, I’d love to see those images! I’d be happy to post them for you if you aren’t able to do it on your end (not sure what the interface is like from the other side). The fractures must mean there’s some degree of cohesion (but from what?). I wonder if anybody has done a study of grainflow morphology on Earth – I’ve got one or two papers but nothing that looks in this sort of detail. I’m sure it’s been done (or if not then you should!). One thing I’ve noted is the grain sizes seem to be smaller than I expected, and I wonder if that would affect the morphology. Maybe small enough grains would be cohesive enough to produce cracks under tension. How do we explain the dramatic difference in colour between the surrounding plain and the crater interior? If dark sand has moved across the plain in the wind and formed “tail” structures there, why does no dark sand show except in the crater? The standard explanation for the widespread bright uniform colour of Mars’ surface is that most in places a thin layer of bright dust covers darker materials. 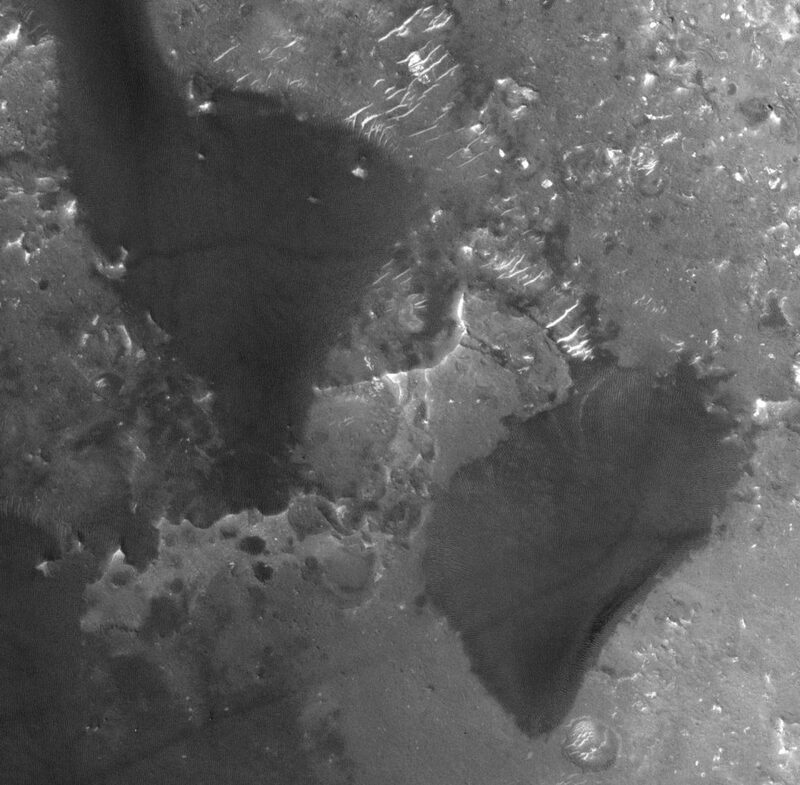 Why would this layer be absent from the surface of the dark sand in the crater? 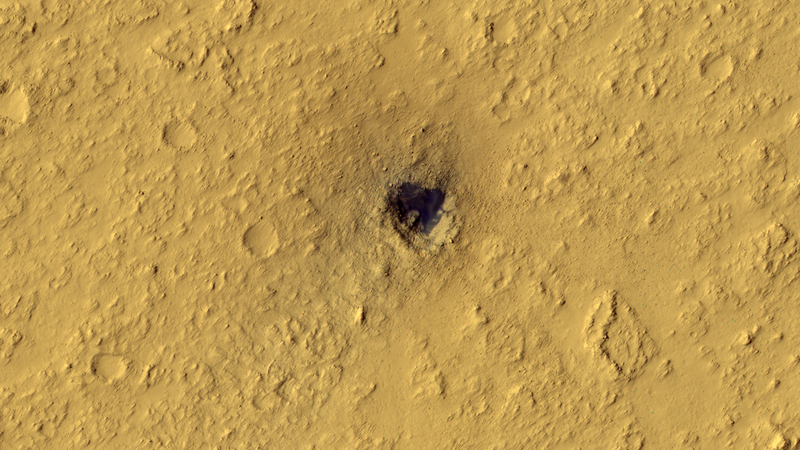 We might expect the more wind-protected crater interior to collect more settled dust than the plain, not less. This is another Mars mystery. All three rover sites show these striking differences in albedo and I’ve been studying them long enough to doubt that they have a simple aerodynamic explanation. I suspect that there’s a fairly constant stream of dark sand going through this area. You can’t see it in the image because there’s not enough of it piled up in any one place (except in the crater) to be visible. Since the dark sand in the crater is actively moving on occasion, it easily kicks up any dust that settles out on it. That constant flux of dark sand is enough to erode some, but not all, of the dusty deposits, which is why you see the tails in the lee of obstacles (or possibly they’re sand shadows like Rocknest, so they’d be made of dust-covered sand rather than just dust). I think the standard explanation of bright dust over dark surface is true in many, but not all places.